Very Good. A new paperback edition of the 2002 Pulitzer Prize Winner for Biography, a portrait of John Adams, published to tie in with HBO's award winning 7-part mini-series airing on More 4. Trade paperback (US). Glued binding. 751 p. Contains: Unspecified, Maps, Frontispiece. Good. 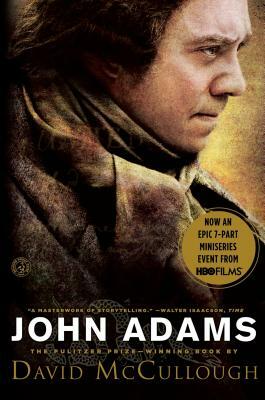 A new paperback edition of the 2002 Pulitzer Prize Winner for Biography, a portrait of John Adams, published to tie in with HBO's award winning 7-part mini-series airing on More 4. Trade paperback (US). Glued binding. 751 p. Contains: Unspecified, Maps, Frontispiece. Very Good. Reading bend to front cover, . Clean book with light bends in spine from reading and may have a bookstore stamp inside the cover. Quick response! John Adams had been the most overlooked of the American Founders until. David McCullough's large, popular biography largely corrected this omission and brought the character and achievement of Adams alive for today's reader. McCullough describes well the essential role Adams played in his long life in our Nation's founding. The stages of Adams career, each filled in their own way with accomplishment, can be divided as follows: 1. early years as a young attorney culminating in his courageous defense of the British militia responsible for the Boston Massacre; 2. ceaseless advocate for American Independence during the First Continental Congress; 3. Diplomat to France and Holland during the Revolutionary War and American negotiator of the peace treaty; 4. Diplomat to Britain to negotiate commercial treaties for the fledgling nation 5. first Vice-President of the United States; 6. second President of the United States who successfully kept the country out of war with France; 7. retirement in Quincy. Each of these periods of Adams's life is described in detail with good attention paid to giving the reader a feel for time and place. I thought the descriptions of early Philadelphia and of Paris both before and after the Revolution were well done. McCullough also concentrates on Adams's character. He emphasizes Adams' honesty and integrity, admitted to even by his opponents, his love of learning, his relationship with his remarkable wife Abigail and his sometimes sad relationships with his children, and his relationship with other leading figures of the time including, of course, Jefferson, Washington, and Franklin and many others. Adams' vanity, his sharp temper, and his ambition also come through well in the book. For all of Adams' accomplishments, I was most impressed with the final stage of his life following his 1800 loss of the Presidency to Thomas Jefferson. Adams retired to his farm in Quincy, Massachusetts and devoted himself to reading and to extensive correspondence. In particular, Adams and Thomas Jefferson effected a reconciliation following the conclusions of their Presidencies and exchanged a remarkable series of letters on their thoughts on government, their political experiences, their reading, and simply on growing older and wiser. These letters are indeed treasures of American literature and thought. Both Adams and Jefferson died on July 4, 1826, the fiftieth anniversary of the Declaration of Independence, as befitting the stature they have for our country. Virtually on his deathbed, Adams was asked for a toast for the celebration. He responded with the words that are the title of this review. This is a deservedly popular book. May it awaken in the reader an appreciation of our country's revolutionary past and a devotion to its present. Readers interested in Adams may explore the three-volume collection of his writings in the Library of America together with a large single-volume collection of the letters of Abigail Adams. This book goes way beyond the mini-series. I have enjoyed listening to this book slowly but surely, eavesdropping on the comments left in letters of John and Abigail Adams, Thomas Jefferson and so many others. Letters and other documents were beautifully harvested for the modern reader and leave the reader/listener feeling as if her were part of the scene. McCullough has taken us on a useful trip through time and created suspense for events we already know the results of. This is a great audio book about a Great Man and his wife. I hated to hear the end. Reader was excellent. Brand new copy of this historical biography that arrived in perfect condition. Amazing documentation.